I don't believe in the old saying "any publicity is good publicity." As a Public Relations consultant, I'm naturally averse to it. Is being arrested good publicity (unless you're a rapper)? No. Is being recorded spewing racist epithets during your stand-up routine good publicity? Not at all. Is dying good publicity for a superstar? Only for the heirs. But there's always an exception to the rule, and the recent Late Night "spat" between Tonight Show host Jay Leno and future host Jimmy Fallon WAS, I believe, that exception. For about a month, both stars traded barbs about yet another messy Tonight Show host transition. Well, it was mostly Leno, a living legend and comic genius, appearing to vivaciously attack his own network's executives in his monologues. Each snipe - like the St. Patty's Day snipe about NBC execs being the very same "snakes" that Patrick drove out of Ireland - was repeated eagerly on the news the next evening, and even before that, was breathlessly tweeted out by millions who love to follow the foibles of late night TV, as well as by the Tonight Show itself. Finally, on April 1, Leno and Fallon got together and, with the help of some talented tenors, who contributed their voices for the voice-over, taped a long-distance duet about the "feud" via telephone in an extremely popular segment, which aired on Fallon's show the next night. The video has had over 790,000 views on YouTube, to date. The next day, it was announced that Fallon was indeed going to take over for Leno in Spring, 2014, ending Leno's 22-year tenure on the show - excepting, of course, the abortive stint of Conan O'Brien hosting it for seven months in 2010, which ended in Leno's triumphant return to his position. Ratings soared during this little "spat" between Leno and Fallon, as the entire nation tuned into hear Leno's feathers get ruffled by ruffling the NBC Peacock's feathers. And ratings are the bread and butter of television. Which got me thinking: Something's not quite right, here, this time. And while I have NO inside information, I believe my hunch is right. While the tension between Leno and the network during the 2010 abortive retirement fiasco was demonstrably real, and tangible, this latest event didn't have the same feel. Sure there was animus, and some of that has clearly built up over the years between the likes of NBC Entertainment Chairman Bob Greenblatt and others who reportedly were angry with Leno. But the key for me in comprehending the brilliant publicity tactics used during Leno's latest, and likely last, retirement was the timing of that Leno-Fallon duet. The fact that it was done at all means that, at least by April 1, both knew that a peaceful, friendly transition was going to happen. But the fact that attacks on NBC were being spewed by Leno right up until that last day (he said on April 1: "NBC and I have reached a peaceful, amicable agreement that is both beneficial to both sides.... April Fools! I got nothing to do with that! Silly! Silly! Ridiculous! [Will] never happen!") tells me that, unless a (literal) last-minute rapprochement was reached between NBC and Leno that night, he knew, likely a week or two earlier, that this was going to happen. So my question is: What did Leno know, and when did he know it? Did he and Greenblatt, or others at the network, plan this all out together, months ago, to milk the ensuing "controversy" and ratings that could be garnered from it? And another question: Is Leno the most Machiavellian, clever, comedic and timing genius on the face of the earth for pulling off a ratings coup as his last, great act on the American Television stage? Now, THAT wouldn't surprise me one bit. 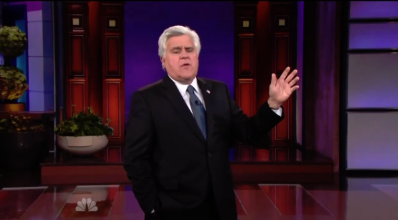 And if so, well played, Jay Leno! Well played! Stephen Abbott is a public relations consultant from New England. He can be found online at abbottpr.com. He founded and edits world politics news, a blog covering politics throughout the world.